[31 March 2019] – On 13 March 2019, the US State Department published its annual country reports on human rights for 2018 (the Report). The Report is mandated by Congress and documents human rights conditions in nearly 200 countries and territories. Staff in US embassies around the world compile the information contained in the Report. As in previous years the Report highlights human rights violations by multiple actors in the region and considers the treatment of Palestinian children held in Israeli military detention in detail. As in previous years the State Department confirmed that since 1967 Israel has applied two separate legal systems in the West Bank depending on whether an individual is a Palestinian or an Israeli settler. While Israeli military law technically applies to everyone in the West Bank, in practice Palestinians are prosecuted in military courts while civilian courts, with greater rights and protections, are exclusively reserved for the 412,000 Israeli settlers living in the same territory. This situation violates a fundamental legal principle that no state is permitted to discriminate between those over whom it exercises penal jurisdiction based on race or national identity. According to the Report, 82 percent of Palestinian detainees arrested by the Israeli military authorities in the West Bank during the year were held in prisons located inside Israel. It should be noted that transferring prisoners out of the West Bank to prisons inside Israel violates Article 76 of the Fourth Geneva Convention and is classified as a war crime under international law. Israel ratified the Fourth Geneva Convention in 1951 and continues to rely on the Convention as the legal basis for prosecuting Palestinian civilians in military courts, although rejects the application of the same Convention in relation to settlement construction. The Report notes that detainees, including children, are not always informed of the reasons for arrest at the time of arrest. 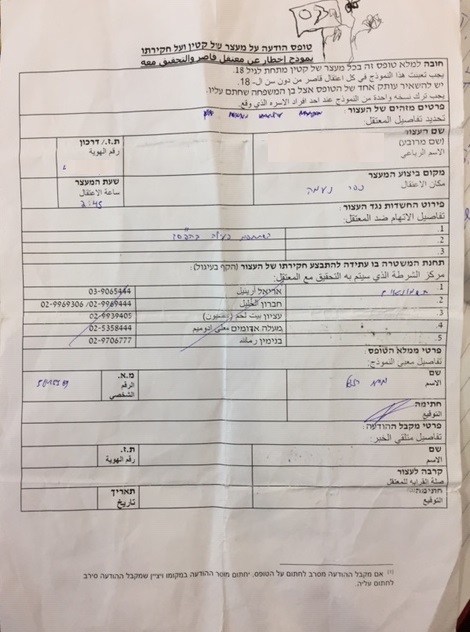 According to the most recent evidence collected by MCW, parents of children arrested from home in the West Bank by the Israeli military were provided with written notification, as required under military regulations, in just 38 percent of cases. In the majority of these cases, the notification was written in Hebrew. While children are generally permitted to consult with a lawyer prior to interrogation under Israeli military law, the Report cites data suggesting that this right is ignored in 76 percent of cases – even though Israel’s Supreme Court has noted the fundamental nature of this right. The Report also cites findings from over 400 testimonies collected from children detained by the Israeli military authorities in the West Bank which confirmed the widespread use of blindfolds, hand ties, physical abuse and threats. This body of evidence tends to confirm findings made by UNICEF in February 2013 that “the ill-treatment of children who come in contact with the military detention system appears to be widespread, systematic and institutionalized throughout the process.” UNICEF again confirmed these findings October 2013 and February 2015. For a second year in a row the State Department has deleted references to the West Bank, East Jerusalem and Gaza as “Occupied Territories” in a departure from international law. Further, on 25 March 2019, President Trump recognized Israeli sovereignty over the Golan Heights. The combination of these developments makes it uncertain what legal principles underpin State Department reports and calls into question the US’s commitment to the principle of non-acquisition of territory by force enshrined in Article 2 of the UN Charter; a principle universally accepted since 1945. These developments potentially have far reaching legal implications beyond the region including the situations in Crimea and the South China Sea. Also for a second year running, the State Department has applied a different reporting methodology to its Israel/Palestine report compared to the reports prepared for all other states and territories. No explanation has been provided for applying different methodologies but the effect is to limit what weight can be given to all 200 State Department country reports which now appear to be subject to political interference.